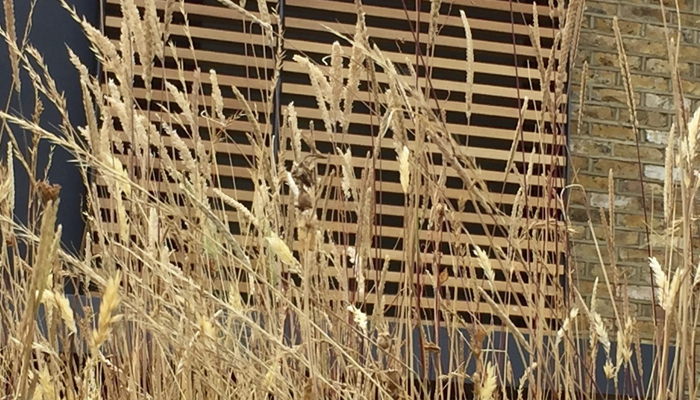 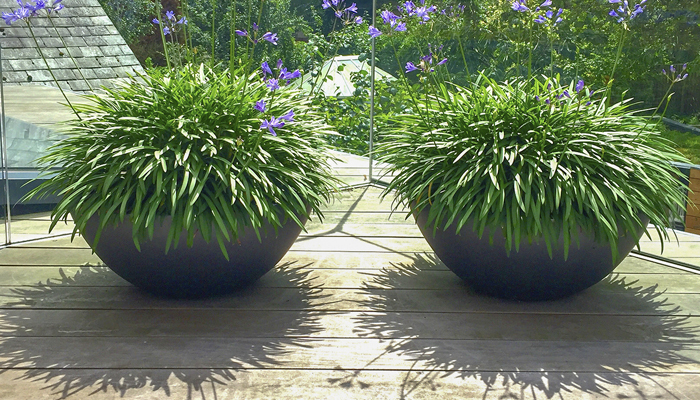 My clients gave a great brief and we worked together, incorporating favourite plant choices into the design. 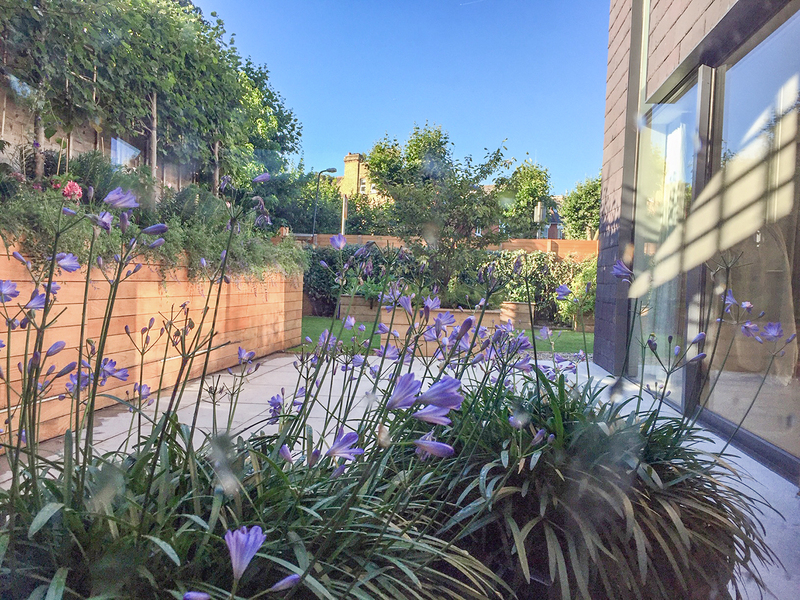 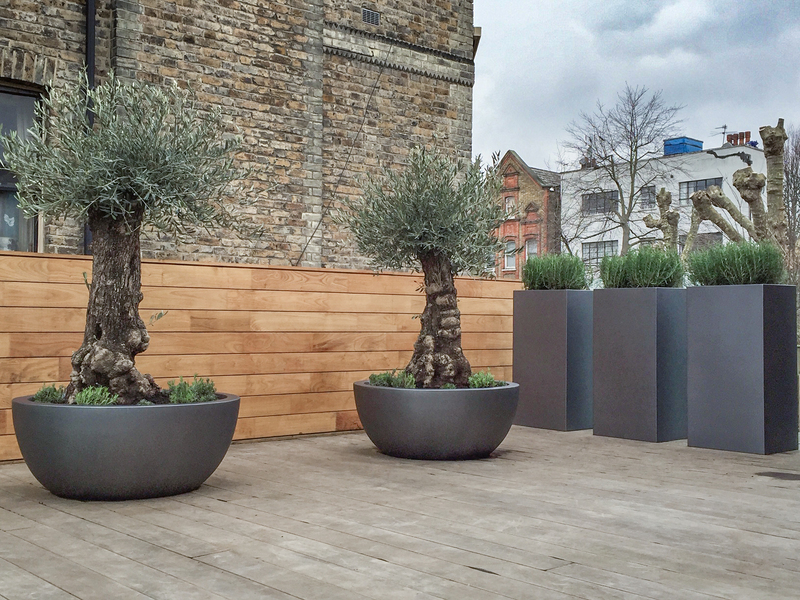 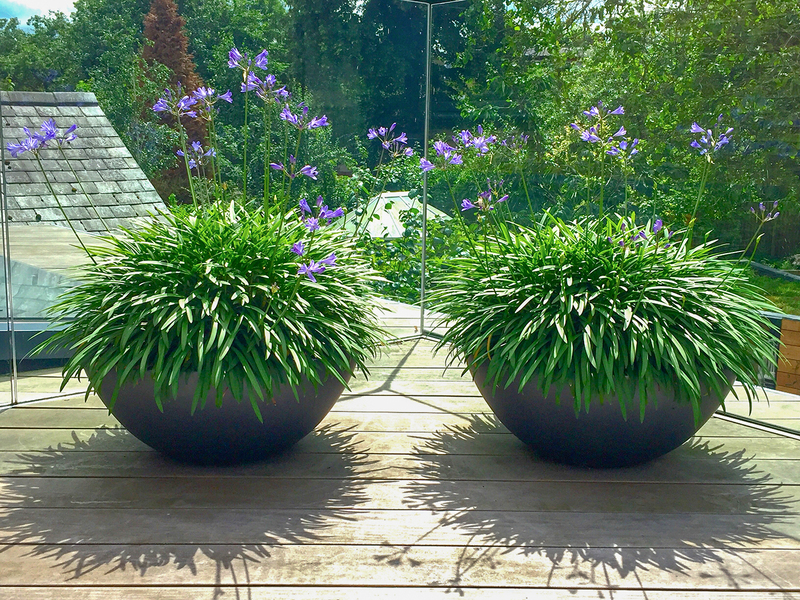 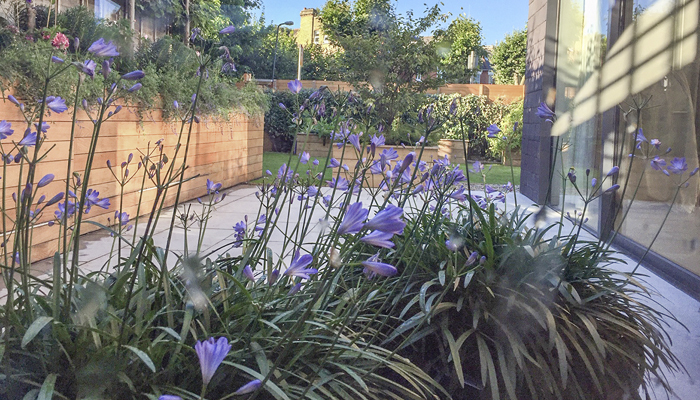 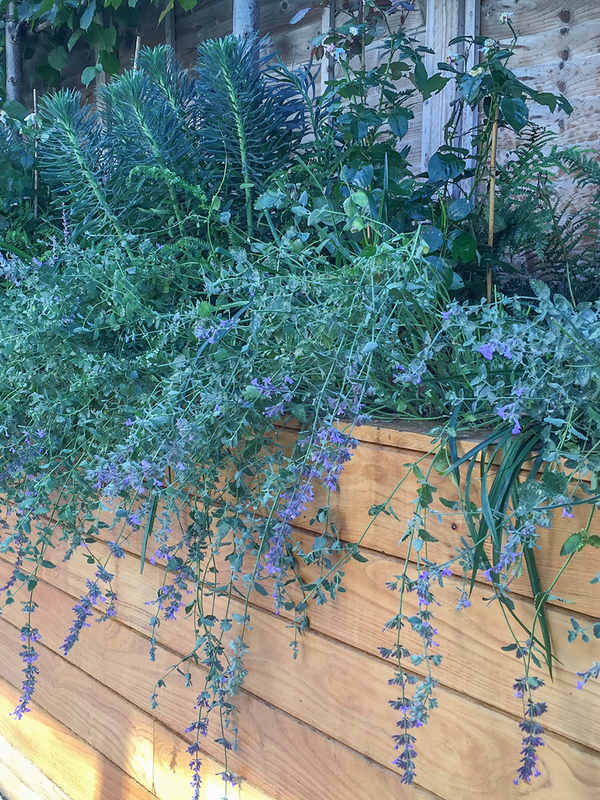 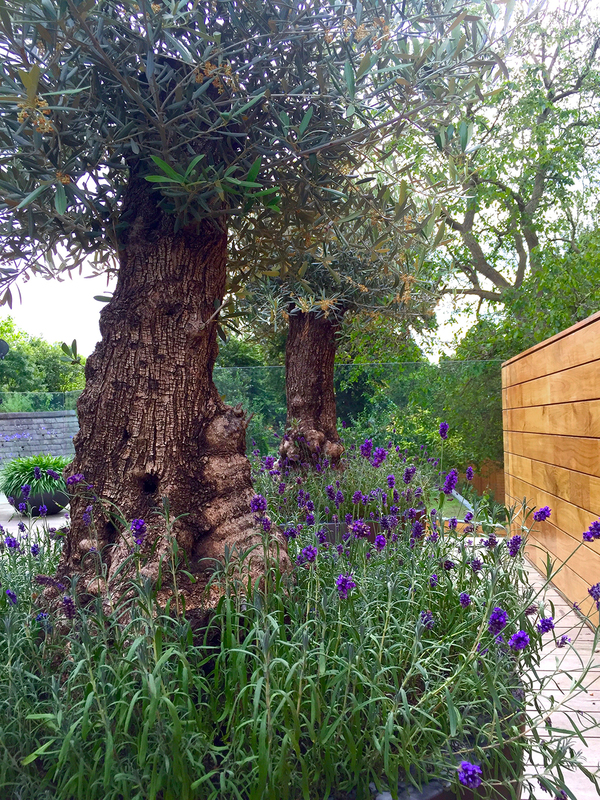 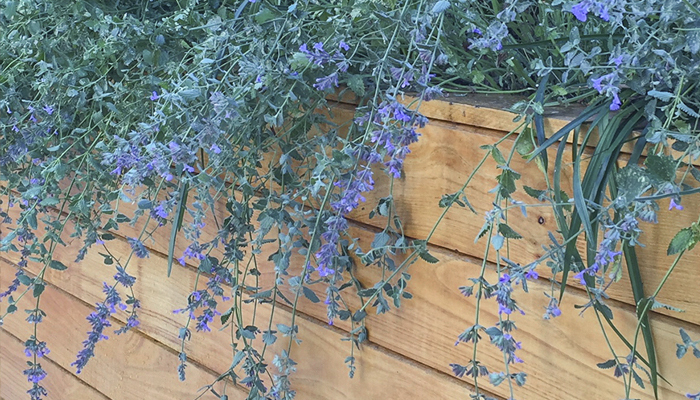 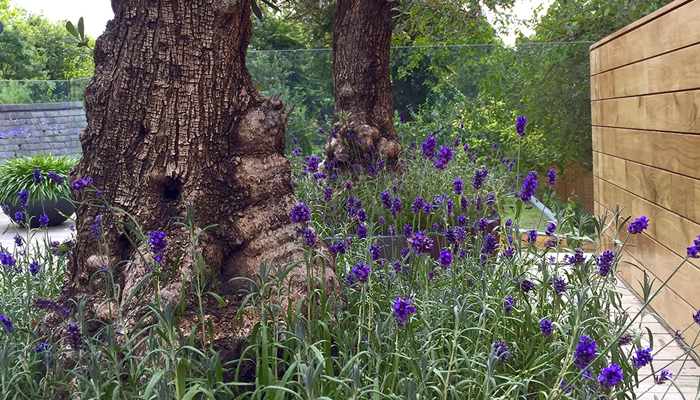 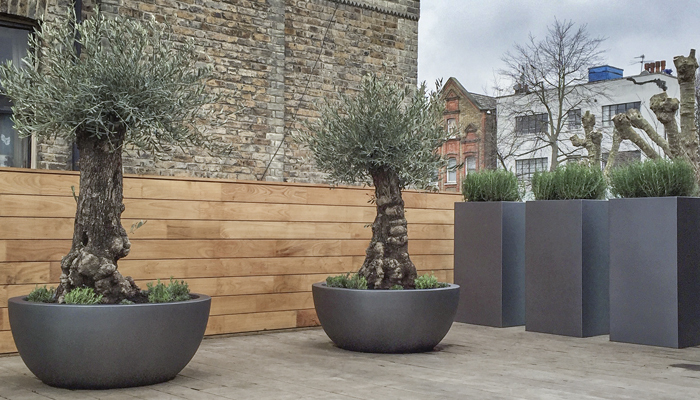 The garden has four distinct planting areas: Master bedroom roof terrace with south facing aspect, where Mediterranean plants grace the space, Olives, Rosemary and Agapanthus. 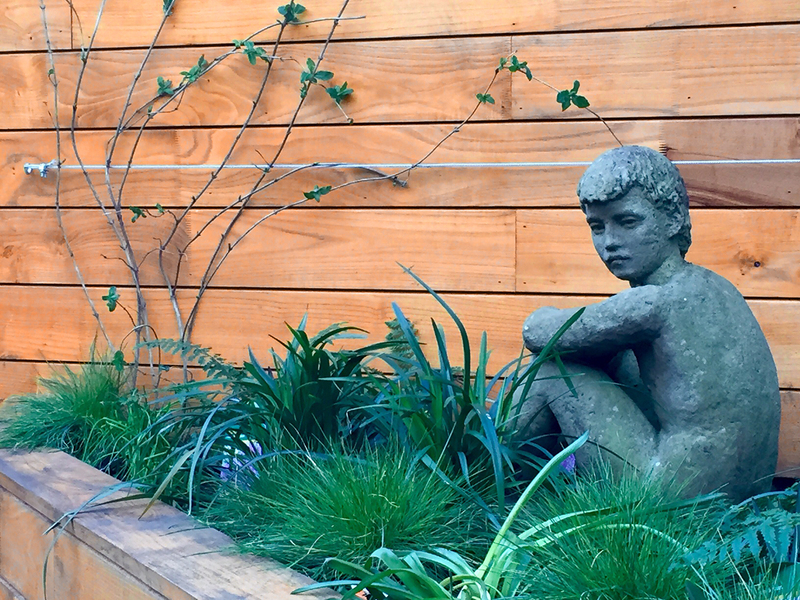 The Rear Garden: Soft ferns and Festucas cushion the ground in the rear garden where a commemorative stone statue of a boy sits amongst the foliage. 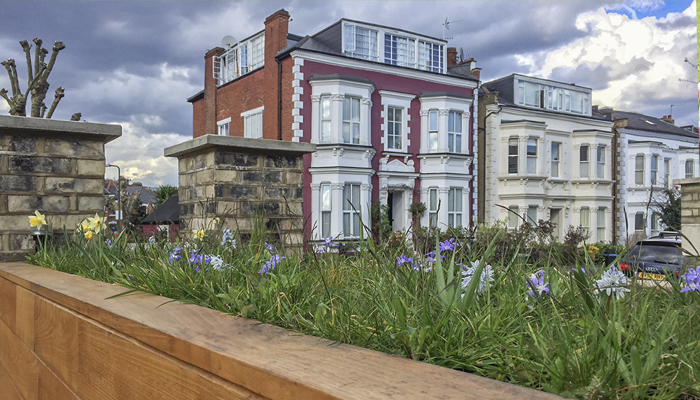 A backlit stained glass window from the original house is sited here against the boundary, bringing together the old and the new. 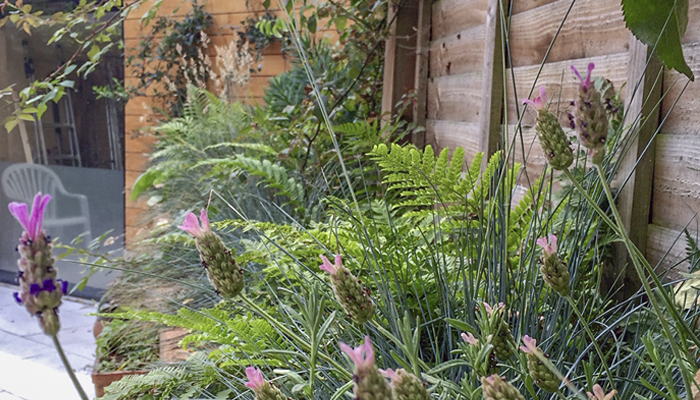 A multi stemmed Betula is planted in front of the window with Alliums and ferns. 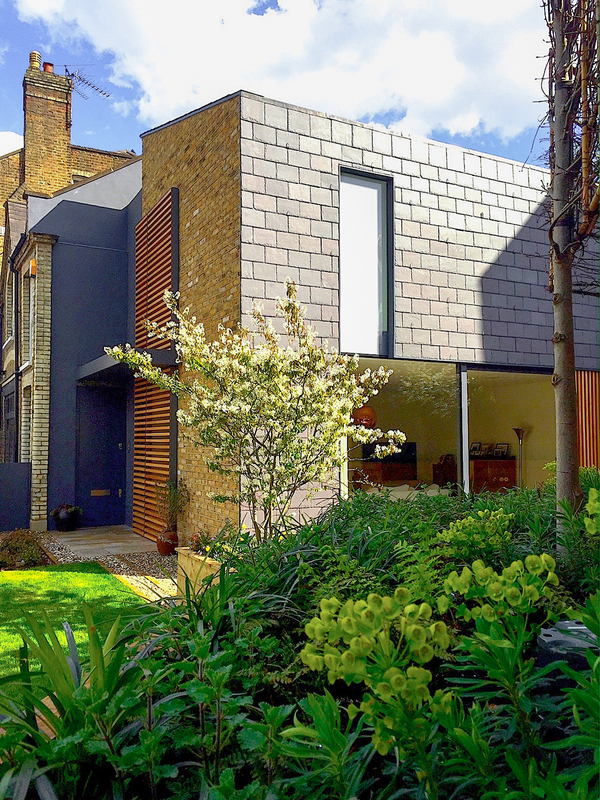 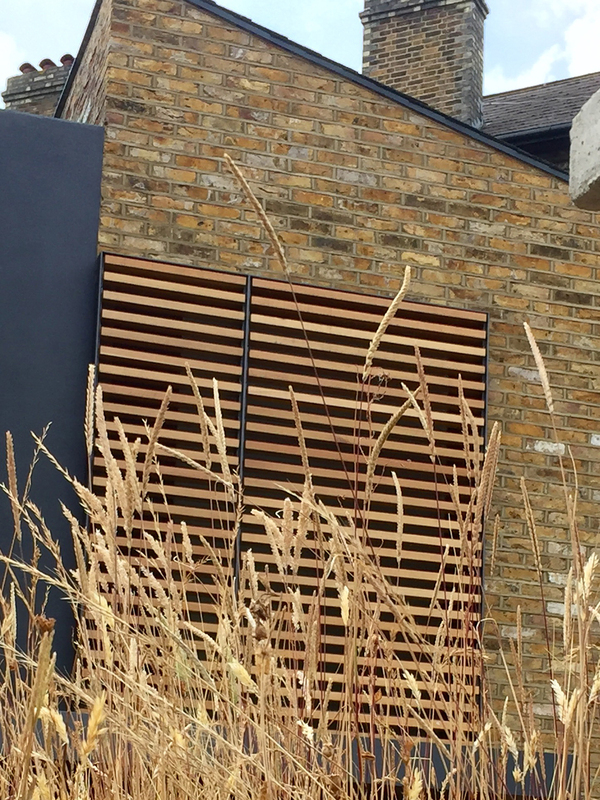 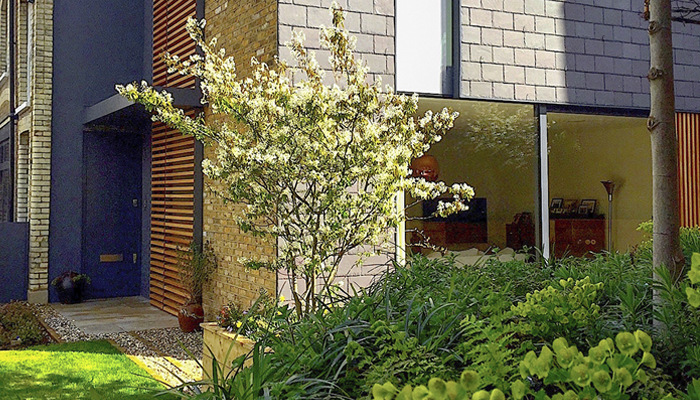 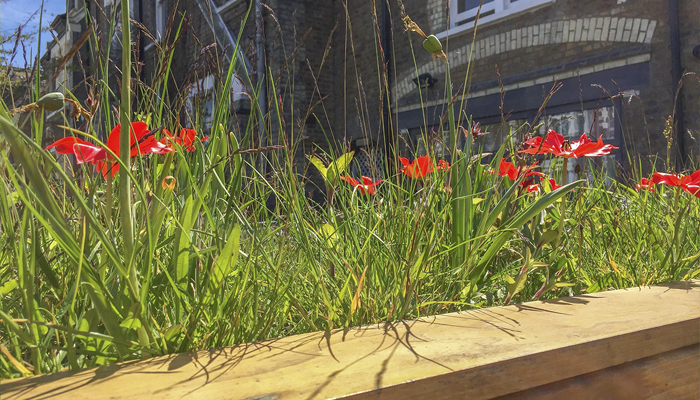 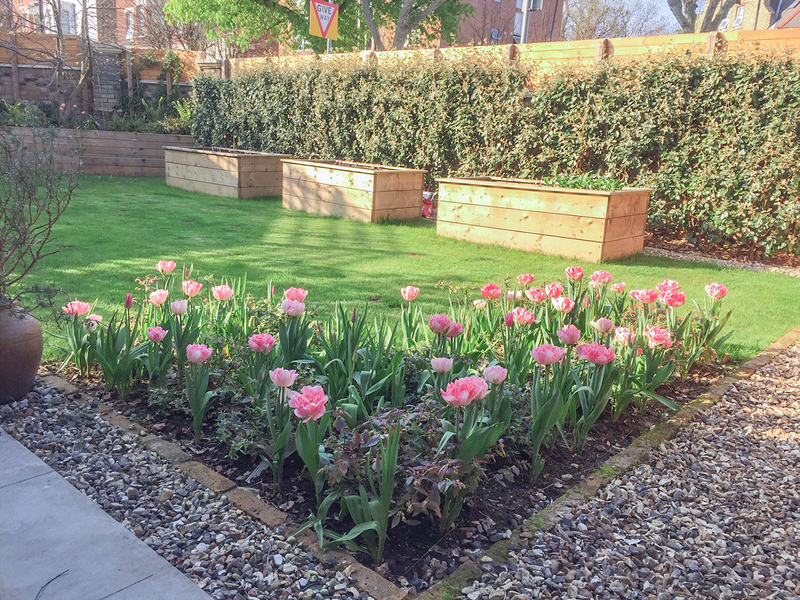 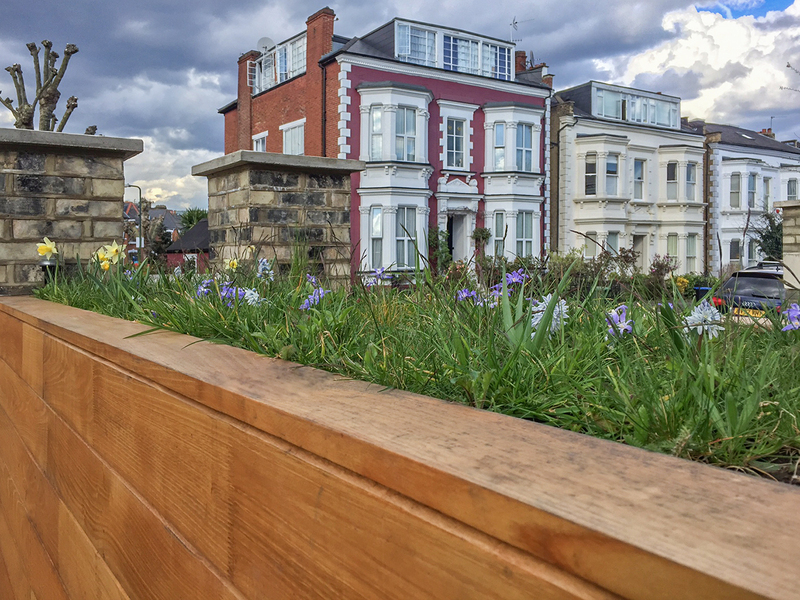 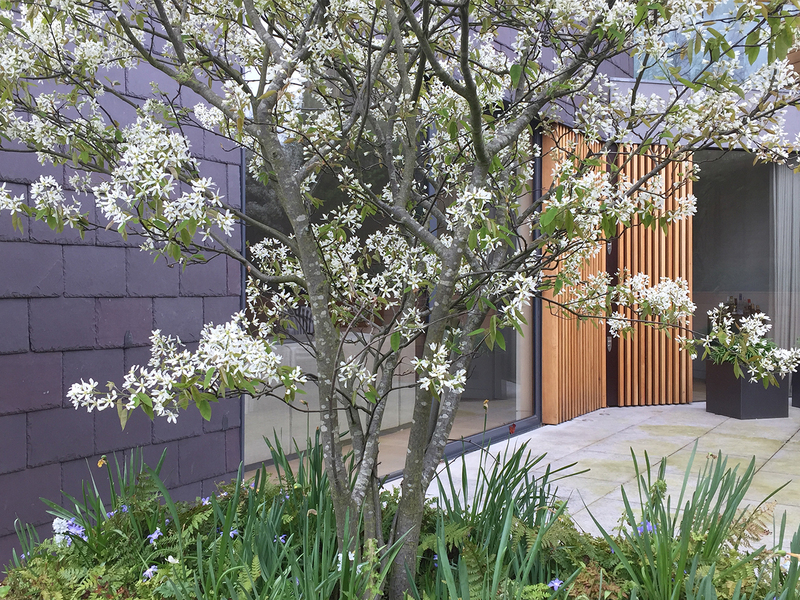 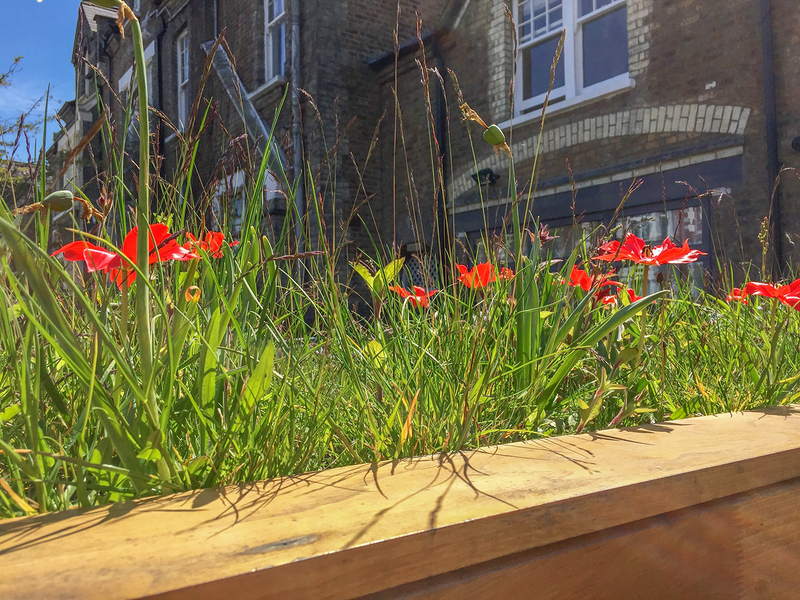 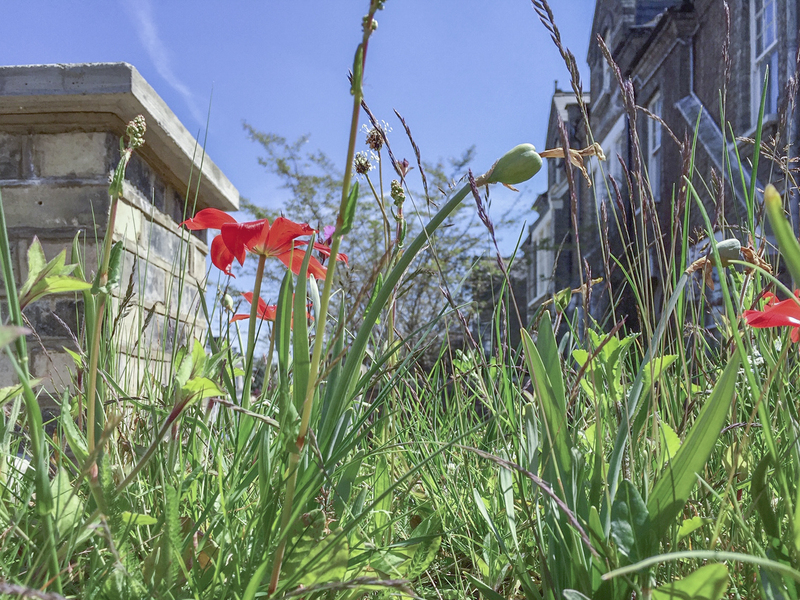 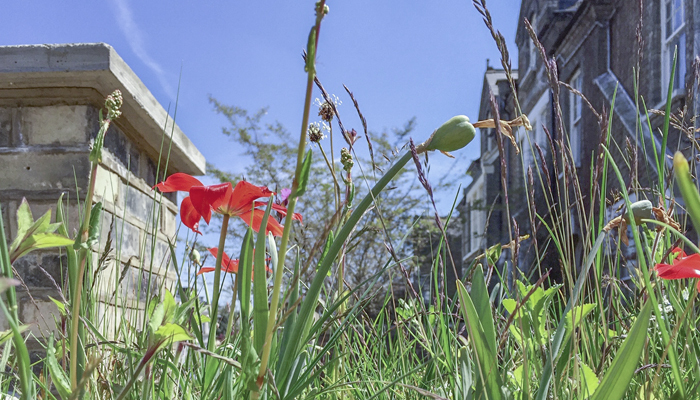 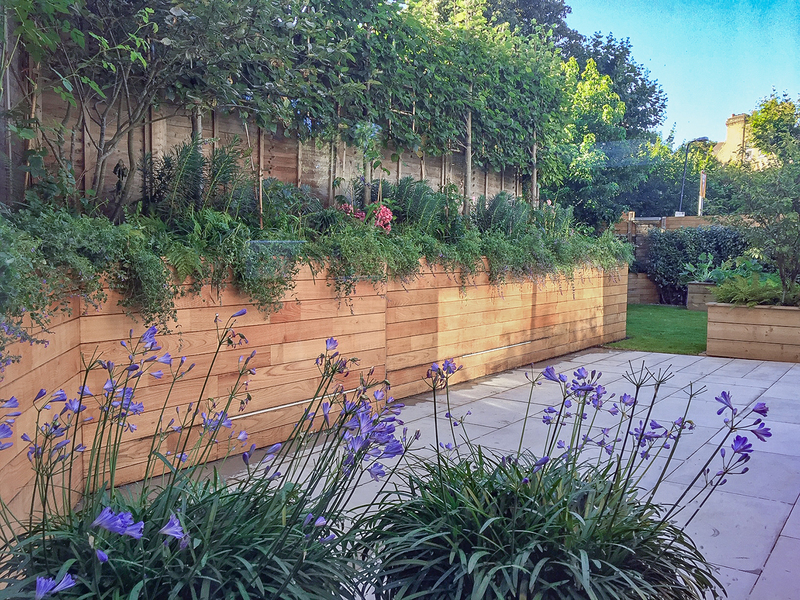 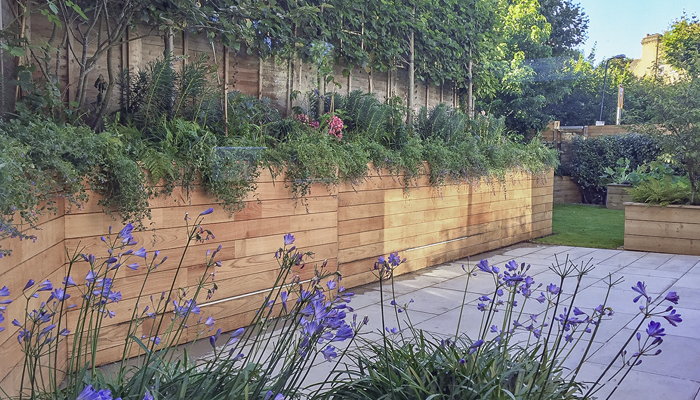 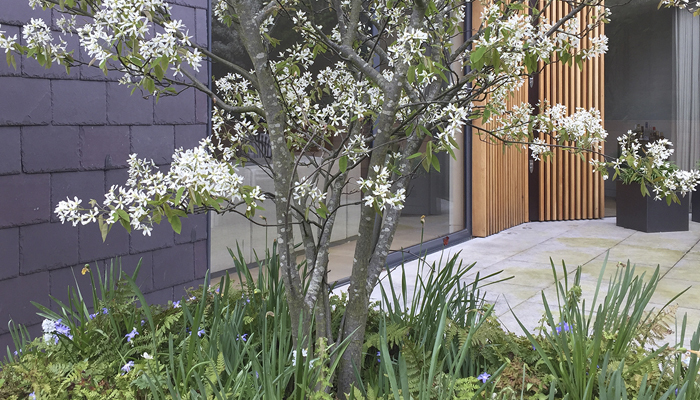 A side terraced garden at ground level has been created pushing back the earth with a raised planted area and retaining wall faced in cherry wood. 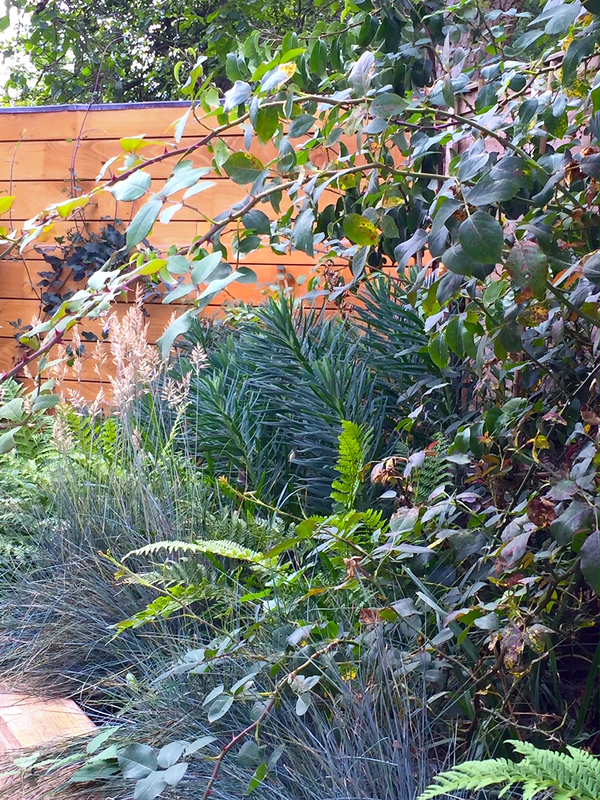 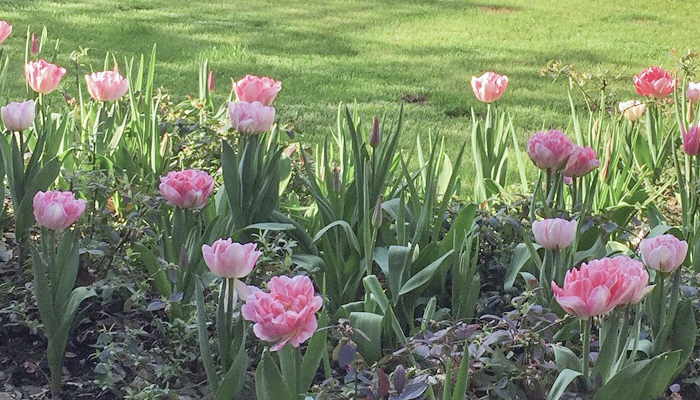 To create a privacy screen here, mature pleached Tilias formed the high level planting and an Amelanchier creates sculptural Winter, Spring and Autumn interest, underplanted with a profusion of Roses, Euphorbias and Nepeta, viewed from below Front garden: the lawn was a challenge. 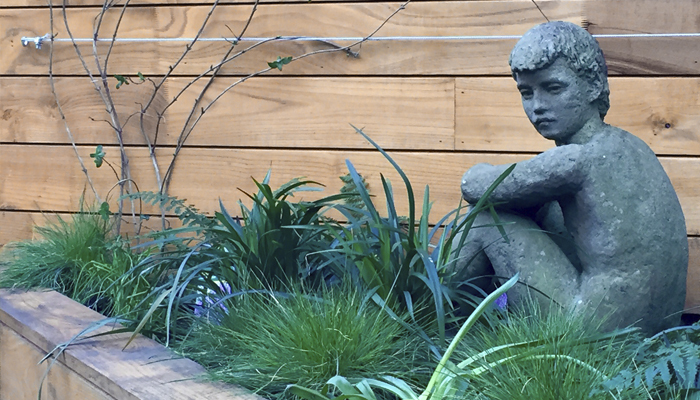 The soil level had been lowered and the unforgiving clay was worked on to provide a good subsurface for the turf. 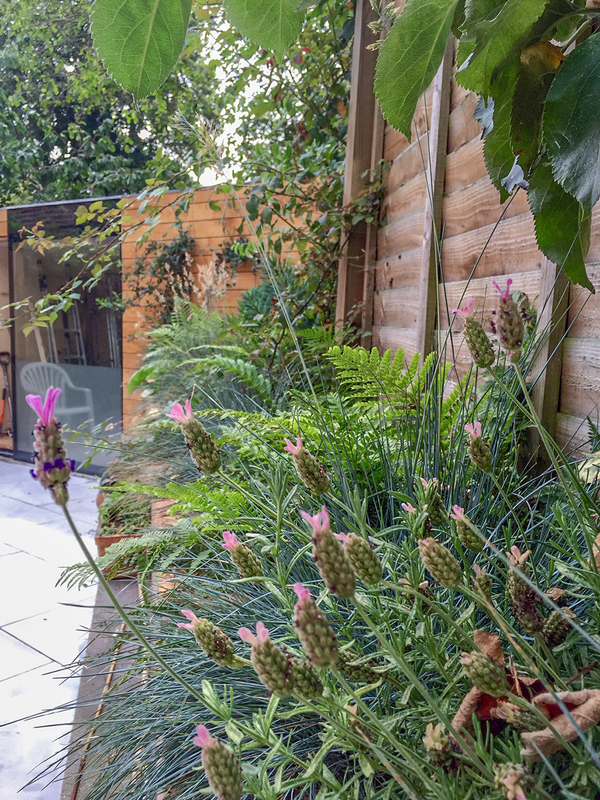 To mark the corner boundary of the property and to give structure and majesty to this front garden, a Liquidamber was planted where the evening sun will catch its' Autumn spectacle of rusts and fiery reds complimented by the underplanting of Achillea Terracotta and Knifophia ‘Tawny King’. 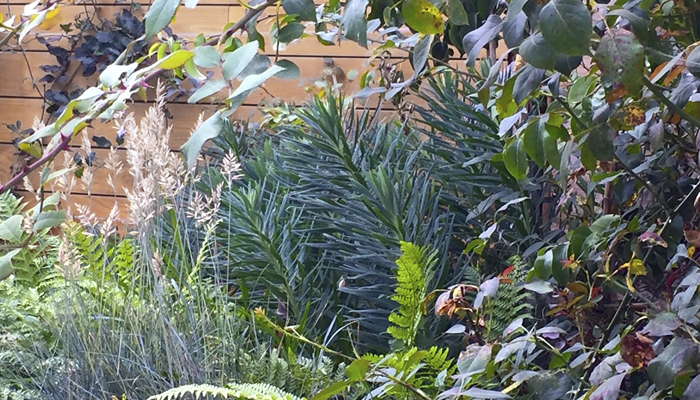 The Autumnal foliage has the perfect backdrop in the original London stock brick wall which surrounds the garden.